Top 15 Weirdest Food From Around The World!!!! 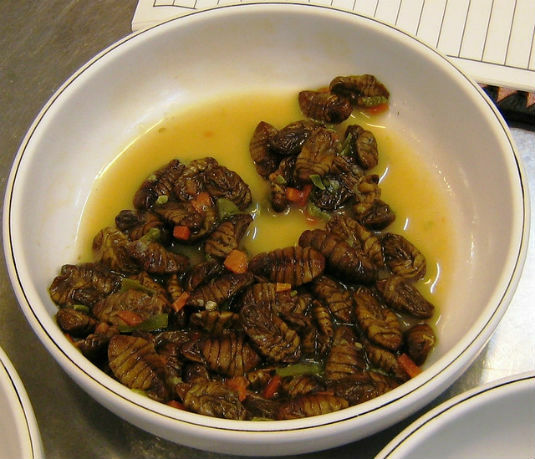 It’s time to take a trip around the world and delve into all the weird foods our species like to chow down. Unfortunately, the world isn’t only full of those tasty breakfasts we spoilt you with a while back – if only. Consider this a public service and an education to save you from shock when you come across these, the 50 weirdest foods from around the world. 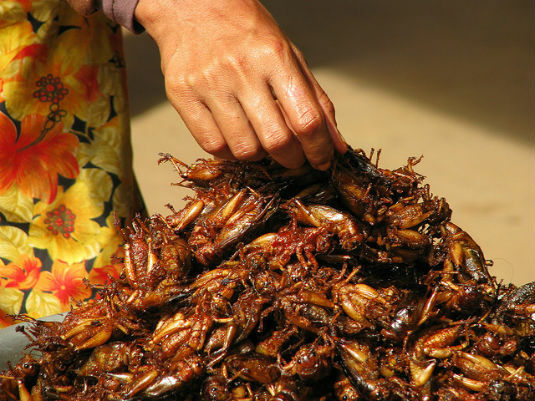 Available throughout Cambodia, but a specialty in the town of Skuon, these creepy crawlies have been deep fried in garlic oil until crunchy on the outside and gooey on the inside. Typically of the tarantula variety, the practice of eating these spiders may have started during the brutal reign of the Khmer Rouge when villagers had to find alternative sources of food. Spiders are often sold to travellers passing through town and looking for a quick snack. Besides being full of protein, rumour has it that they are even said to increase the beauty of the consumer. A sheep’s heart, liver and lungs minced and mixed with onions, oatmeal, suet, stock and seasoned with salt and spices cooked inside the animal’s stomach. Traditionally stuffed into a sheep’s stomach and simmered, this hearty dish dates back to the 1400’s and today is served as the main course of a Burns supper on Robert Burns Day. Typically eaten with tatties and neeps (mashed potatoes and turnips), it is often served with a dram of Scotch whisky to get it all down. 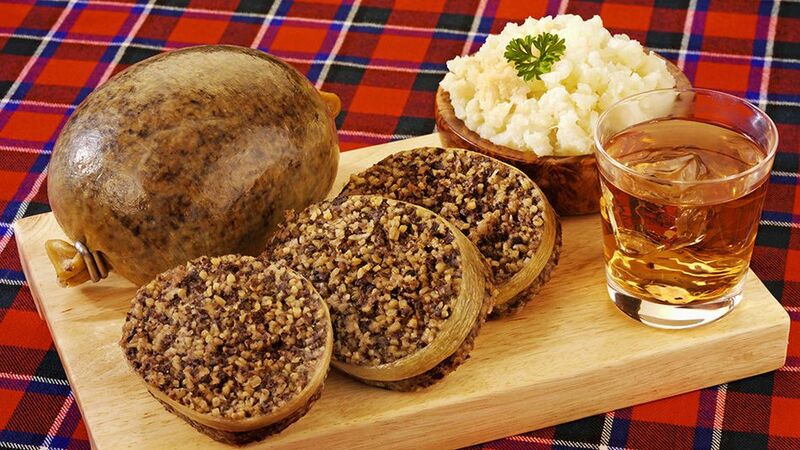 Today, Haggis is conveniently available ready-made from the grocery store and is a great source of iron and fibre. 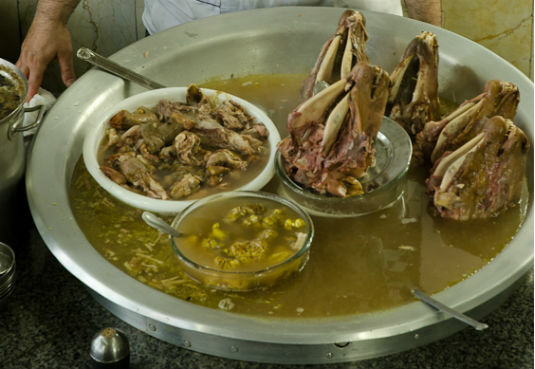 A pretty gruesome little dish made up of stewed cows feet and head. It was once a winter comfort food but is now considered a delicacy. I’m sure it’s fine, so long as you don’t mind that grinning skull staring at you through its cold dead eyes. 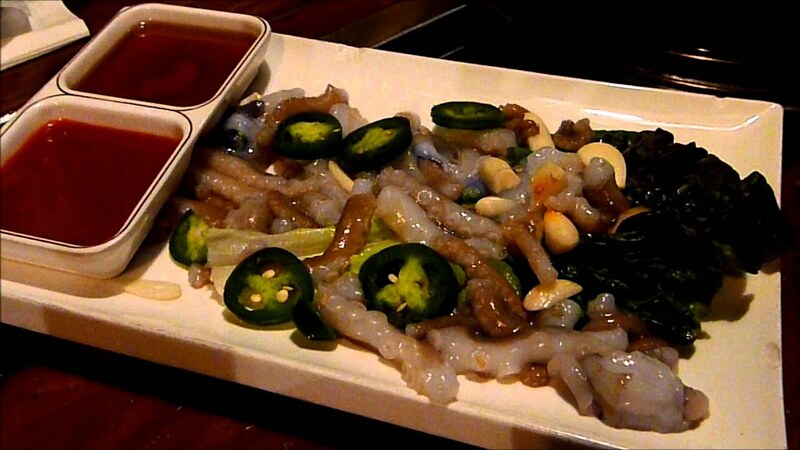 A South Korean delicacy, this dish of live octopus is eaten either whole or in pieces depending on the size of the specimen. 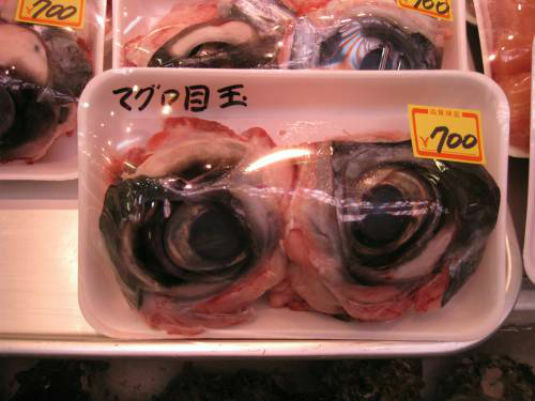 Served raw and usually only with a splash of sesame oil, it’s so fresh that the tentacles are still squirming. Suckers from the octopus can attach themselves inside the throat of the consumer causing choking or even death, which makes eating this mollusk a scary proposition. Although the actual octopus is mildly flavoured, the live animal wrapping itself around the diners. 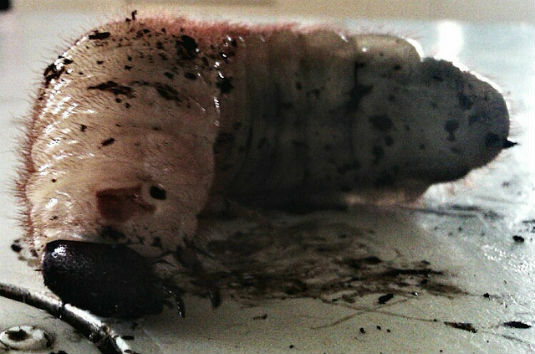 Although it sounds nasty, apparently it’s rather tame, tasting pretty similar to squid or octopus. None of the gunk you’d normally associate with slicing up eyeballs. What is so strange about oysters? Probably the fact that they’re not the kind you find at the bottom of the ocean, but rather a fancy name given to deep-fried testicles of a buffalo, bull or boar. 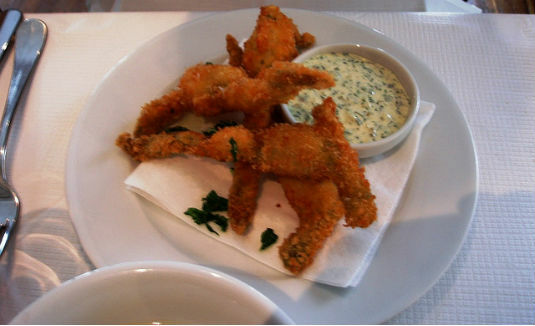 Rocky Mountain oysters (also called Prairie Oysters) are well-known and regularly enjoyed, in certain parts of the United States and Canada, generally where cattle ranching is prevalent. The testicles are peeled, boiled, rolled in a flour mixture, and fried, then generally served with a nice cocktail sauce. Now this really does sound bad. 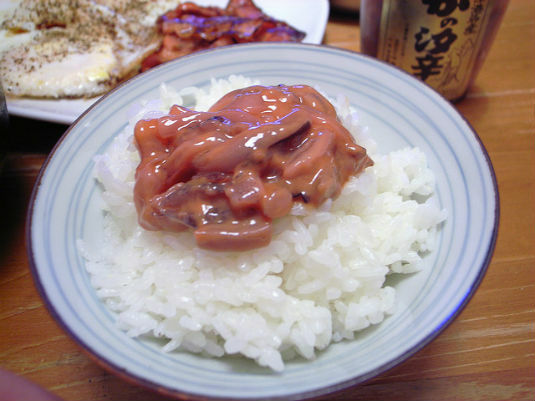 A dish made of pieces of meat taken from a selection of sea creatures, served in a brown, viscous paste of their own salted and fermented viscera. Oh, I forgot to say, it’s all served raw. 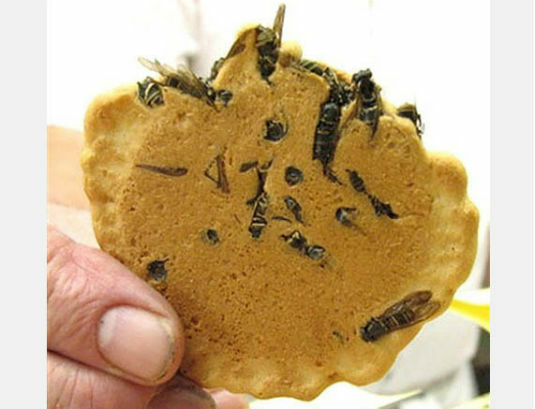 Yep, you guessed it, it’s a biscuit filled with wasps. Think chocolate chip cookies, only the insects replace the choccy chips. Apparently the digger wasp, which the biscuit contains, has a pretty mean sting. So, yes, this is a big old grasshopper seasoned with salt, pepper power and chilli and fried in a big wok. Tastes a little like hollow popcorn skin… except a little juice squirts out when you bite. Simply boiled or steamed and lightly seasoned, this is popular snack all over Korea and usually sold from street vendors. Apparently they taste like wood. Part of the Australian ‘bushmeat’ family, this was another staple of Indigenous Australians in the desert. These can either be eaten raw, when it tastes like almonds, or lightly cooked, where its skin crisps like roast chicken and its insides take on the look and consistency of scrambled egg. 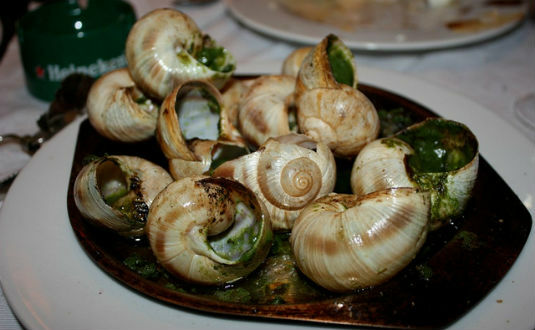 Snails cooked in a sauce of white wine, garlic, butter and parsley served in their shells. Said to have a similar consistency to mussels or clams, though I found them to be pretty rubbery. Perhaps best to try in a decent, reasonably priced restaurant rather than the satay version down a back street in Hong Kong. Pretty much summed up in the name, this is a hardboiled egg that been left to go cold and stuck in a jar of vinegar. 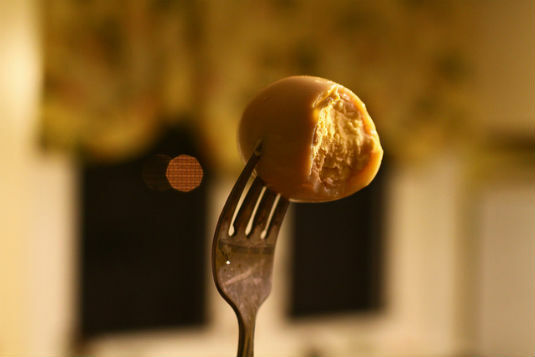 The sour liquid penetrates right to the heart, meaning the powdery yolk in the centre is uncomfortably sour. What’s there to say? Basically the back end and back legs of a frog, grilled, baked, fried or stewed. With the texture of chicken with a very faint taste of fish, it’s one of my favourite kind of meats. crocodile meat is considered a delicacy in many places around the world, supposedly tasting like a cross between chicken and crab. 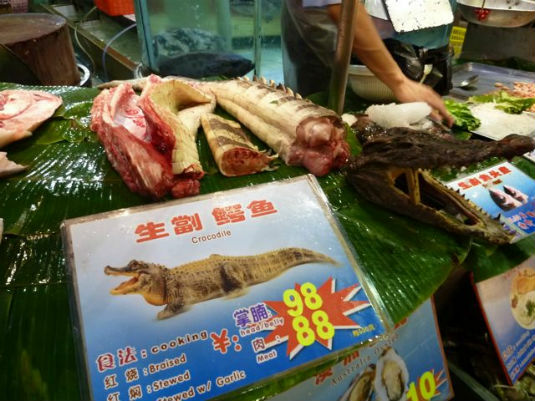 Although crocodiles are protected in many parts of the world, crocodile meat is usually farmed, so is sustainable if not particularly kind or natural.